Hard to manage spills when you’re on the move? Not anymore. The Transport Spill Kit is a compact solution designed for service vehicles, transport trucks, small workshops or any location where storage space is at a minimum. It is suitable for containing and cleaning up any fuel or oil based liquids. Effective on fuels, oils, and hydraulic fluid spills or leaks that occur in the workplace. For use by any business that has identified risks due to spilt liquids, these include Government, Heavy Industry, Transport, Manufacturing, Service Industry, Construction, and Waste Management Companies. Highly absorbent — one duffle bag worth of contents can absorb up to 45L of oil. Comprehensive solution — a combination of pads and powdered absorbents results in a quick and complete clean-up, with no remaining residue. Compact — small kit that is well-suited to small spaces and vehicles. 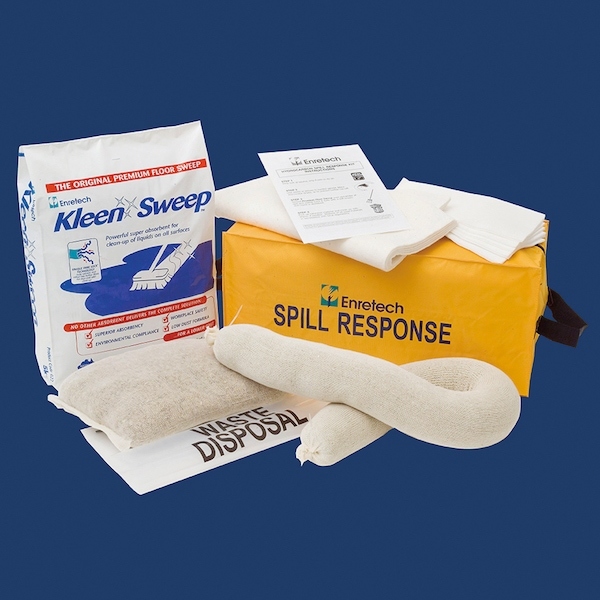 For more information, A PDS for the Transport Spill Kit can be downloaded here.